According to the latest research by wisemetrics, the half life of a tweet is about 5 minutes – for Facebook it’s five hours. Social media posts are powerful for connecting with exiting followers, attracting new ones and promoting events. They’re also transitory. It’s like saying “Hi” to someone in passing – nice to do, but it doesn’t last. Meanwhile your well-crafted email, sent to an interested audience, could be opened, read and acted on two to three weeks later. Email is a personal message sent to your InBox. Not unlike old-fashioned mail, I have a sense someone thought I would like to see their message. And don’t be disillusioned by bulk emails or spam – people will weed out unwanted messages and still read a message that appears (either because of the sender or subject line) to be relevant to them. When you send a high-value, targeted email it’s not unusual for 30-50% to get opened and 20-30% of readers to click through to see your full offer. Imagine how hard it would be to get that many people in a room, on a webinar, or to respond to your tweet. My guess is that in the last hour you had a conversation on email – it’s a normal part of our day. You ask questions, share updates, send documents, get clarification and build rapport. You also build loyalty. I haven’t done the math, but every month a percent of my speaking business and product sales come from loyal followers I’ve had past email conversations with. We have built rapport. Rapport is the glue that takes price out of the conversation and keeps a client from shopping around. You can build rapport with email. Sure, some people will choose to unsubscribe and move on. That’s marketing. I remember the day I first used email to share my latest blog post and then watched in horror as the “unsubscribe” number crept up. What I didn’t know was I was watching the wrong number. Just like event planners that don’t ask you back, you aren’t always going to be a perfect fit for everyone. That’s okay – it’s a big world. The number you want to watch is the percent that are opening and responding to your emails – those are the ones you’re building rapport with and getting closer to a sale. All sales are based on knowing your market and solving their problems. 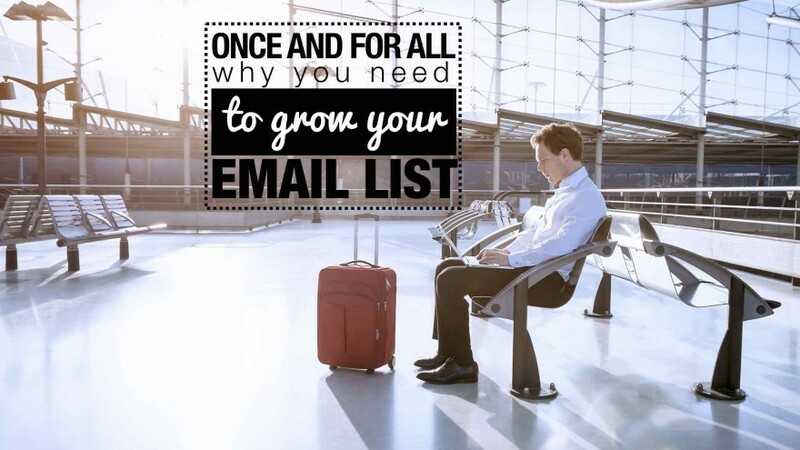 Email allows you to do that – in big numbers. an annual survey to learn follower’s needs, how they describe challenges and desires, what they are currently using, etc. allowing followers to self-select the sub-market they below to (like self-employed, C-suite, agency, etc.) or to opt-out from receiving certain emails. monitoring open and click-through rates to refine future offers. monitoring webinar registration rates to learn what offers have the most value. split testing (with your CRM or a tool like optimizely.com) two offers, prices, headlines or bonus offers. using an automated email sequence following all opt-ins to direct new followers to an offer. Note: Your CRM (Customer Relation Management) allows you to segment your list into buyer groups to send more targeted messages (in Mail Chimp use groups, Infusionsoft use tags, Aweber and Constant Contact use segments). Once you have segments you can more selectively send out updates (for example event planners get fewer and different email updates). Twitter is for news, Facebook for updates, Pinterest for sharing images, YouTube for stories and lessons, email is for communication. When you launch a new product (keynote, book, retreat, membership, training) you need an audience willing to listen. You also need to ask for the sale (the old days of “Product” pages that churned out dollars while you sleep are gone). With email you can ask for the sale. Of course you need to have a compelling offer, at the right time, with the right price and seen by the right people. But, after that you can use email to ask for the sale. When I launched BOSS15 (Business Of Speaking School 2015) with Jane Atkinson we primarily used two webinars and email to fill that program. Our emails explained the offer, gave benefits, described features and moved our followers through a sales sequence so they could decide if this was right for them. And they did. Imagine how hard it would have been to get those people in a room or on the phone to hear our offer. Instead we used email to invite them to webinars and emails to close the sale. Maybe this is the most important argument for growing your email list: it can get you off the stage. I spent the first 10 years of my speaking career trying to fill my calendar with bookings. Eventually, that game gets a little old. Not that I don’t still love speaking and working with my clients. I do. But I wanted more reliable income. So I built multiple streams of income. If you want to add revenue streams to your business (on-line courses, webinars, retreats, mastermind groups, membership programs, even book sales), you need to market through a list. Of course, you can let affiliates do the heavy lifting and get traction from social media advertising, but nothing compares to having a conversation with followers. The formula I follow is simple: bigger list = more product opportunities = more income sources = higher overall sales. Now that’s a real business. Whether you want to maintain your current speaking volume, add products or replace some speaking income with products, you need a list. Now it’s time to make list building as important as sales. Hugh Culver is CEO of SOS (getsos.net) creating smart traffic growth for bloggers. He is also an author and speaker. You can find Hugh in the eSpeakers Marketplace.